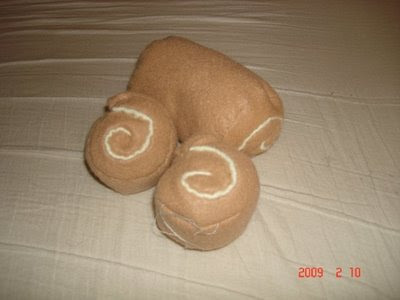 A Swill Roll cake. It's so yummy. Wait is that a thread? Oh yea I guess we shouldn't eat it, since it's made from felt cloth. I used my sewing machine as much as a could since I wanted something durable, but in the end I still had to close it up with old fashion hand stitching.